This photograph of the planned location for the new Cracker Barrel Old Country Store in New Albany was shot by NANewsweb.com Tuesday afternoon and was taken looking northwest from parking lot of the Hampton Inn. I-22 is adjacent to the site. The sign for the Glenfield exit off of I-22 is visible on the left side of the photo. New Albany, MS– Cracker Barrel has filed plans for a New Albany location with the city zoning authority. The plans filed Tuesday, Oct. 4, at city hall are for a new Cracker Barrel Old Country Store near the intersection of Interstate 22 and Highway 30 in New Albany. Access to the new restaurant will be via Coulter Road. The building site lies immediately northwest of the Hampton Inn in New Albany. 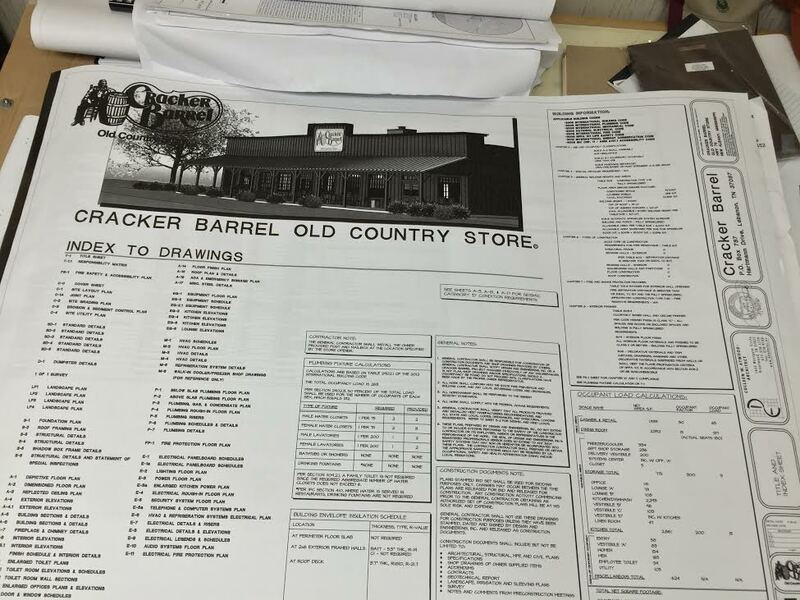 Photo shows the top sheet of a set of drawings for a New Albany Cracker Barrel, which are on file at city hall. No date for start of construction or planned time of completion are evident from the documents on the public record. Cracker Barrel management officials are known to have spent time in New Albany recently, and speculation by knowledgeable sources is that the construction is likely to start soon. Cracker Barrel Old Country Store, Inc. is headquartered in Lebanon, Tenn., approximately 25 miles east of Nashville. The company has about 640 locations in 43 states. The present Cracker Barrel location nearest to New Albany is north of Tupelo, on the east side of Highway 45, not far from Barnes Crossing Mall. Cracker Barrel reportedly generates annual revenues of about $2.5-billion. Uncle Herschel’s Favorite, yum, yum!